Artist Jenny Prinn has created a home and studio in Yarmouth much like one of her paintings—rich in color, full of vibrancy, and multi-faceted. 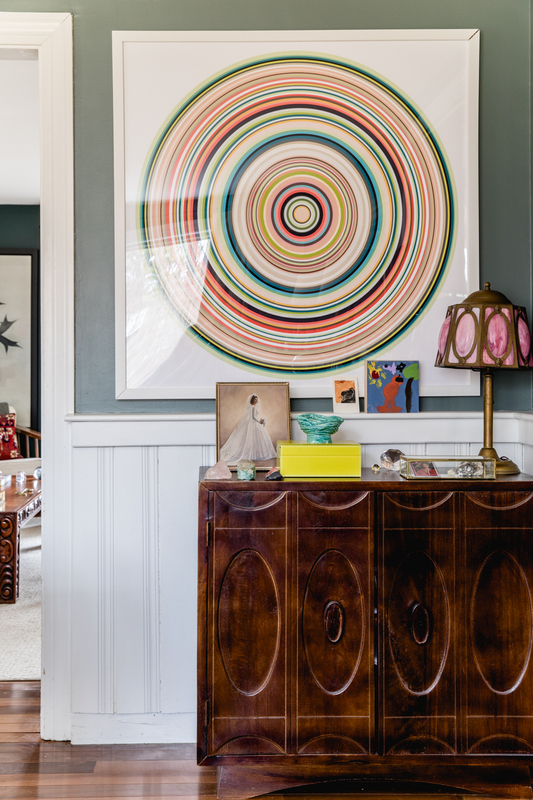 The daughter of two antiques dealers, she has layered her space with treasured pieces inherited from family and works of art by artists she admires. From a variety of eras and styles, the items all work together effortlessly to tell a story that is not easily defined or contained. Her collection is the kind that has no rules, that takes risks, and that rewards the eye at every turn. We asked Jenny to share her thoughts on her home and her art. THE MAINERS: You live in Yarmouth, which has to be one of Maine’s most charming small towns. What year was your home built? And what do you like about it? JENNY: 1970, the same year that my husband and I were born—a great year for people, not a great year for houses! I can start by telling you what we don't like about it: the low ceilings! (It's a good thing we aren’t really tall.) But I would have to say that my favorite features are the open spaces we created, all the built-ins my husband built, and the screened porch. We basically live on the screened porch from May until almost November. We eat, read, play games, and watch TV out there—even if it means that I put on a down vest and hat. THE MAINERS: Many artists recall being drawn to art at a very young age—other artists report having a turning point later in life where they changed course entirely to pursue their art. Do you remember when you first heard the call to become an artist? JENNY: I really don’t. I just remember always wanting to have a job doing something creative. (I also remember everyone always saying you can't make a living being an artist.) However it was when I turned 40 that I decided that I could do this. It was so cliché—a woman hitting her 40th birthday and deciding that she had nothing to lose, that she would only have herself to blame if she didn’t give it a try. It was a big step for me to think that, one, I had enough talent and two, that I had a perspective or voice that people would appreciate and want to purchase. It was terrifying, but I am so glad that I had that moment of strength and clarity. When I’m second-guessing myself or feeling self-doubt I try to channel that 40-year-old’s guts and determination. 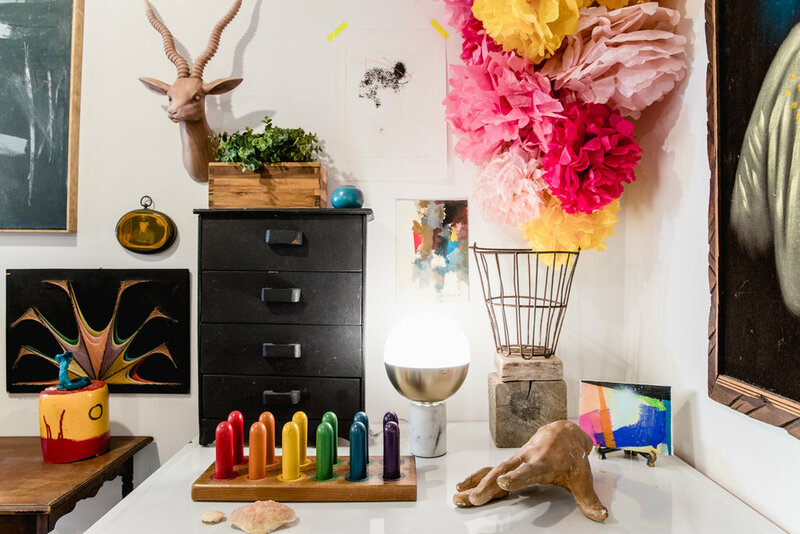 THE MAINERS: How do you think being an artist influences how you see your space? JENNY: In the compositions of my spaces I am acutely aware of the importance of rhythm, pacing, pattern, color, and negative space. I am always trying to push the compositions in my artwork and I like to do the same in my spaces. For that reason, my spaces constantly evolve and change. I move things around. 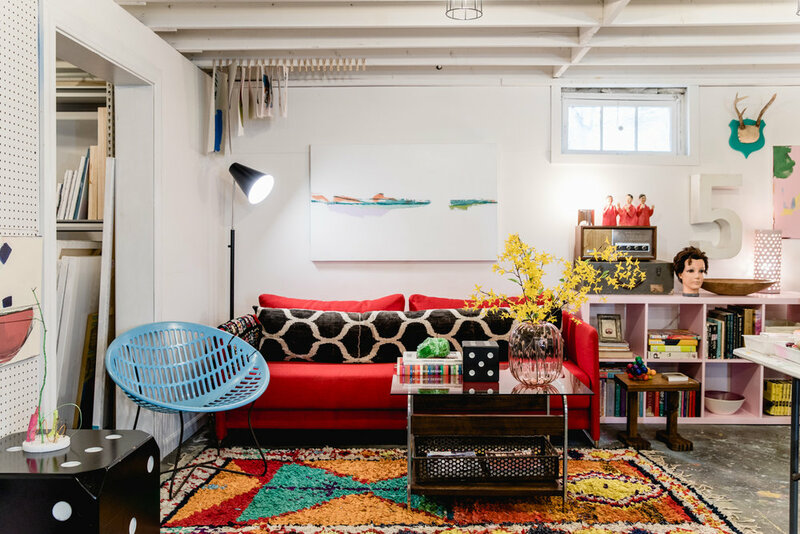 THE MAINERS: You have an incredibly vibrant home, much like your artwork. What draws you to color? JENNY: Honestly, I look at these beautiful all-white or neutral spaces in magazines and online and they're gorgeous and seem so sophisticated, and I think, “I want that.” Yet, it's so difficult for me to keep it neutral! Eventually color will seep into every space. For me, color is a necessity. It's the vehicle that helps me express myself the best. It's like spices for a chef—it's how you add depth and intrigue and personality to a dish. I can't imagine life without it. Go-to weekend meal: Anything that I don't have to cook and that someone serves to me! Analog or digital: Reluctantly digital. I hate that there's not something tangible to hold and look at, but it is so convenient. Favorite place to find inspiration: The ocean. In it, on it, beside it—doesn't matter. Item you're most comfortable wearing: No question—hands down one of my caftans. Best local spot to browse antiques: Unfortunately I don't really know anymore; so many of my favorites are now gone. But I do like some of the group shops that are peppered up and down Route 1 here in Maine—they're great for hunting. THE MAINERS: Your aesthetic is also very beautifully layered. And somehow, everything works together. How do you know when to stop layering? JENNY: Sometimes I don't! I just keep adding items that I love. I have a philosophy (right or wrong) to buy what you love and worry about where it will go later. Oftentimes, I will move an item two or three times over the course of months (and even years!) until it tells me where it belongs. Sometimes it's not obvious from the start. THE MAINERS: Clearly your parents being antiques dealers has rubbed off on you. What have you learned from them about collecting? JENNY: I learned so much from them. I learned to love history in general and to appreciate the provenance of an item. To admire and respect the makers and designers of objects. To recognize design periods—and the “why and how” an object looks like it does. I was exposed to so many different items, time periods, and design styles. My dad was a “picker,” or what they called a “door knocker,” and not only did he love his job, he was really good at it. He was honest and kind and incredibly knowledgeable, which are extremely important if strangers are going to let you into their homes to go through their drawers and attics. Every day he would arrive home with a Suburban full of new treasures, and my parents would go through all the items, big and small. Growing up, my brother and I were a part of this daily event. I learned by osmosis. It's probably why my style is so multifaceted. I love so many styles and periods—it would be impossible for me to choose just one. 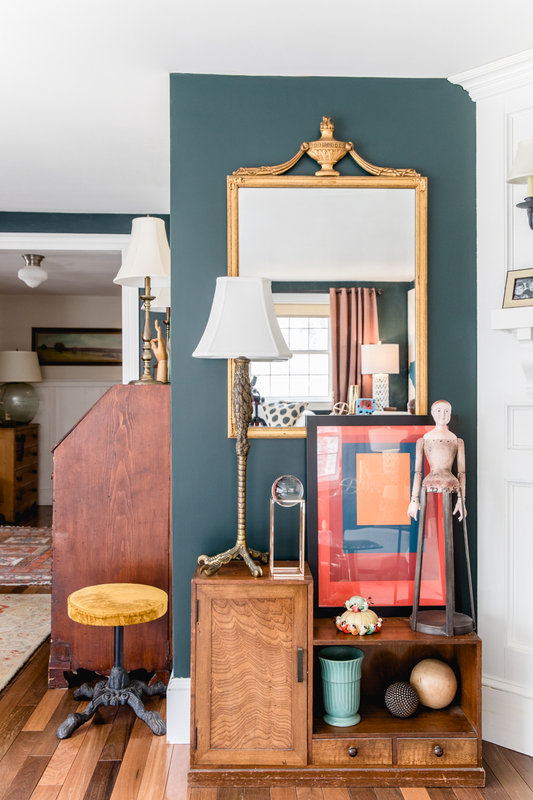 THE MAINERS: What are some of your favorite antiques in your home? JENNY: I have items that belonged to my parents, my grandparents, and my husband’s great-great-grandparents. I am blessed to have these items in our spaces. For me they are a tangible connection to the past and to who my husband, children, and I are. These items have an almost talisman effect for me. The items that I probably love the most are: the pink slag glass lamp from my grandmother, the Drexel coffee table from my parents, the eagle leg lamp from my husband’s great-great-grandparents, my Poul Jensen Z chair, a painting by Alfred Chadbourn from my parents, the Sewer Art sculpture from my dad, a pair of gorgeous portrait paintings from my parents, and my vintage brass and glass coffee table. 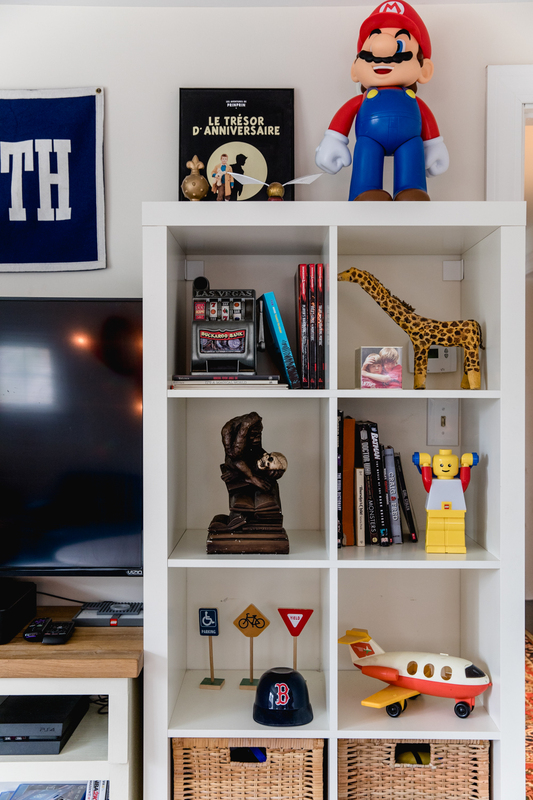 THE MAINERS: Tell me about your favorite pieces of art (by other artists) in your home. What are your most treasured possessions? JENNY: Oooooh, this is difficult! A few of my favorite pieces are my Alfred Chadbourn painting—he is one of my all-time faves (and it’s such a bonus that he was from Yarmouth; I was lucky to meet him and see his studio years ago, when I was a teenager), a pair of vintage portraits by G.A. Williams, four original Hilla Rebay pieces, a Sewer Art/folk art sculpture of a man in a hat, an early painting by Heather Day, two drawings by Katy Ann Gilmore, a limited edition screen print with gold leaf by Lisa Hunt, a small blue portrait of a girl, and our vintage velvet Elvis. Other than photos of my parents and my sons’ art, my most treasured possession would probably have to be the pink slag glass lamp from my grandmother. I have loved it since I was a child. THE MAINERS: Where does your day start out? Where does it end up? JENNY: This is such a non-glamorous answer. My day starts with getting my boys ready and driving them to school. It ends with me driving them to and from practices/rehearsals, making dinner, and cleaning up. Clearly, I'm living the dream! THE MAINERS: It must be convenient at least to work in a studio that is just steps from your kitchen! How does your home studio influence your work? JENNY: It’s amazing! I can work at any hour of the day—which is often until very late at night. And I can be ready to pick my boys up from school and take them to practices, performances, and games. However, the downside is that I am always available to take my boys to practices, performances, and games! It is hard for me to get a solid, uninterrupted day in the studio, with me being so accessible. But I wouldn't change a thing. It allows me to be both a mother and an artist—which is not easy to balance—so having my studio in my home is paramount. My studio influences my work, only in that it’s my space. I have all that space to myself and I can make as big of a mess as needed. I like that it’s so close and accessible, and that I’m able to come upstairs and just close the door behind me. THE MAINERS: How old are your boys, and how has being a mother influenced both your art and your home? JENNY: My boys are 14 and 12.5. This is a good question—I'm not really sure. I guess it has influenced my home in that I want a home filled with lots of character and color so that they gain an appreciation and respect for objects and their history. I want them to know that a home is a way to reflect one’s personality, and that it doesn't have to follow the “rules” or be too serious. As for my work, being a mother definitely influences me in that I try to be brave and to reach for things that I might think are out of my reach. I want my boys to see that I am strong and confident. But it's also great for them to see me when I'm feeling insecure and what I decide to do with that insecurity. I love that they see it's possible to do what you love for a job—but that it takes a lot of work, often times around the clock. THE MAINERS: What other artists do you admire? JENNY: This is such a difficult question! There are so many! I honestly admire any artist who is hustling every day and trying to make a go of this as a living. It's not an easy path! I am in awe of people who seem to do it all so seamlessly. And my taste in art is as varied as my taste in home décor. It's all over the map; there's no rhyme or reason to it. I love what I love, and I make no excuses about it. I am typically drawn to abstract work, although I am a huge fan of hyperrealism—it is so fascinating to me and is so not how my brain and personal filter work. I also adore 16th- and 17th-century portraits and still lifes, and I have a weird thing for portraits without a face. 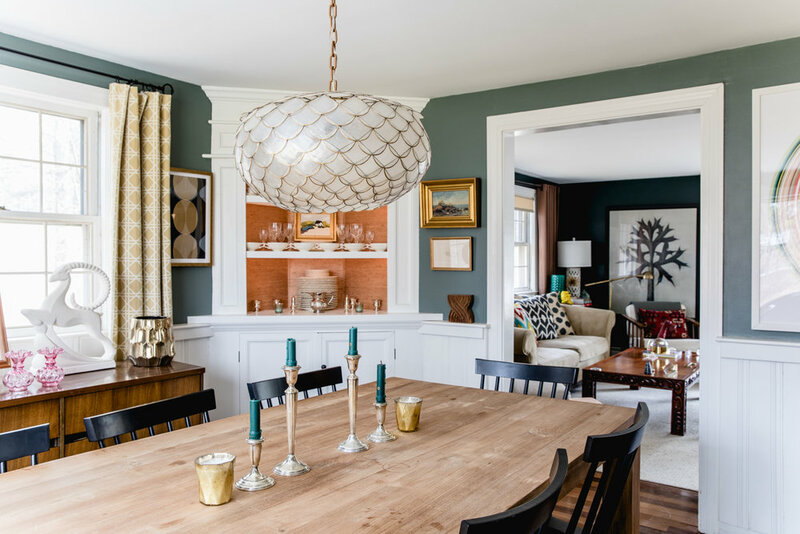 THE MAINERS: Do you ever take risks with your décor? 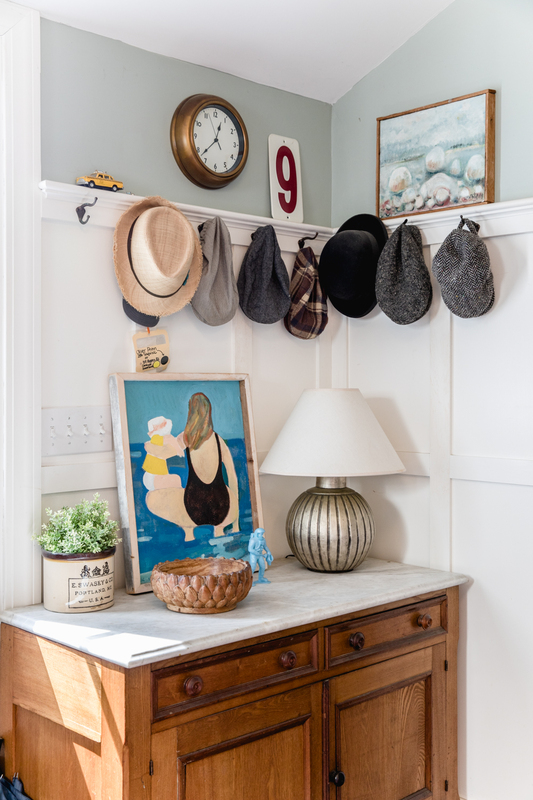 THE MAINERS: When it's time to clear your head, where do you go in your home? JENNY: Other than my studio, it would be the living room in the winter months, and the screened porch the rest of the year. THE MAINERS: What keeps you here in Maine? JENNY: My husband and I both grew up in Yarmouth and we wanted the same experience for our boys. We stay in Maine because of family, its natural beauty, its people, the wholesome environment—and of course, the ocean.